The Capital Region Interfaith Housing Initiative has invited representatives from all three levels of government, and all political parties to join us on September 6, 2018 as we discuss how to respond together to the current shortage of affordable and supportive housing in Edmonton, and across the country. At this meeting, many different faith traditions (Muslim, Jewish, Evangelical, Catholic, Anglican, Sikh, Unitarian, Hindu, Lutheran, Christian Reformed, Mennonite, Quaker, Indigenous and numerous other traditions) will stand up together to express their shared concern about a growing challenge impacting friends, family members and neighbours in all our communities: affording a place to call home. This event will take place at Evangel Pentecostal Assembly from 10am until 1:30pm. the Portable Housing Benefit. A direct help for the 20,000+ households paying more than 50% of monthly income to rent. Land, capital, and Long-term support funding for Permanent Supportive Housing (PSH). PSH has proven itself as direct and effective help for Edmonton’s most vulnerable citizens; providing those with multiple complex needs with appropriate longer-term support and care. A vision for the way ahead: Support and encourage Canadian housing providers to shift efforts toward the Netherlands model*. *Observation: in the Netherlands, housing providers currently house more than sixty percent of the country’s population in sustainable mixed market developments with breakdowns such as: 20% low income; 60% middle income; 20% high income. In these developments, high income housing helps pay for the low income housing to make it a sustainable model for market development. This system required some start up support, but now requires no government funding! To volunteer for this event (to help with food, hospitality, or audio/visual), or if you are a faith leader willing to speak briefly to the need your community sees in housing, please contact mike@interfaithhousing.ca. Iris Court’s journey into existence was not an easy one. Their initial effort to set up in the McCauley community was rebuffed as local neighbours, objecting to an already heavy concentration of services and social housing in their community, took the development to court to stop it. But lessons were learned from that experience, particularly on the need for open and up-front consultation. In McCauley, residents learned about the project as the groundbreaking ceremony was being celebrated. When Iris Court was seeking a home in Bonnie Doon, they chose to proceed very differently. 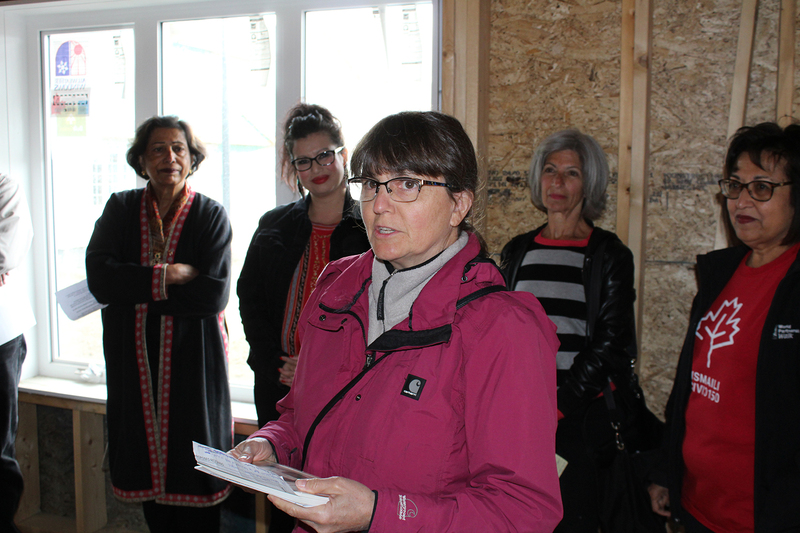 Rubyann Rice, Executive Director for the Schizophrenia Society describes the excitement they had to find an ideal property available with a 21 suite lodge and convent home to the Sisters of Assumption. The board quickly came on side to pursue this location, and the nuns received their offer to purchase warmly. Throughout the process, the nuns were in prayer for their effort to succeed. On the consultation front, they immediately began connection with the Bonnie Doon Community League to keep them informed of their intentions. The facility needed rezoning to classify as a group home, and so, as required, they also sent out letters to a two blocks radius. Councillor Ben Henderson helped greatly with connection and counsel on what was working well and went with them into some conversations. The Society also worked hard to be transparent with their plans and movements. Letters of invite to meetings at Iris Court went out to neighbours to two conversations hosted in the dining room. They asked people to submit questions ahead of time, and to help them host these questions they invited people to speak to the answers. A psychiatrist (serving on the Society’s board) spoke to the services needed. They also had one of the clients speak to his journey and challenge. Rubyann notes that having the client speak helped change the perception. It illustrated the gap between living in a hospital and in a apartment, and the need for supported living. In his story, they met someone living with schizophrenia. The fact that his parents were both doctors illustrated that this can happen to anyone. But Rubyann highlighted that the client they chose was someone who was strong enough to speak and handle the negative language that they knew might arise. These conversations were far from easy, and they certainly did face some hostility. But the society patiently worked through people’s questions, and as people became more informed about schizophrenia and mental illness, and received reasonable answers to their questions, that hostility diminished significantly. Of continuing help to the relationship with the local community is the presence of a Good Neighbour’s Agreement. With the help of Cllr Henderson, they framed this document to share their commitment to resolving concerns in the neighbourhood. They also chose to make it a living document, so it can be altered or updated in the future if needed. A phone number is posted out front of the building in case people have any concerns. The whole process took about eight months, but at the end of it no community members came out to speak against the rezoning; even with an invitation. 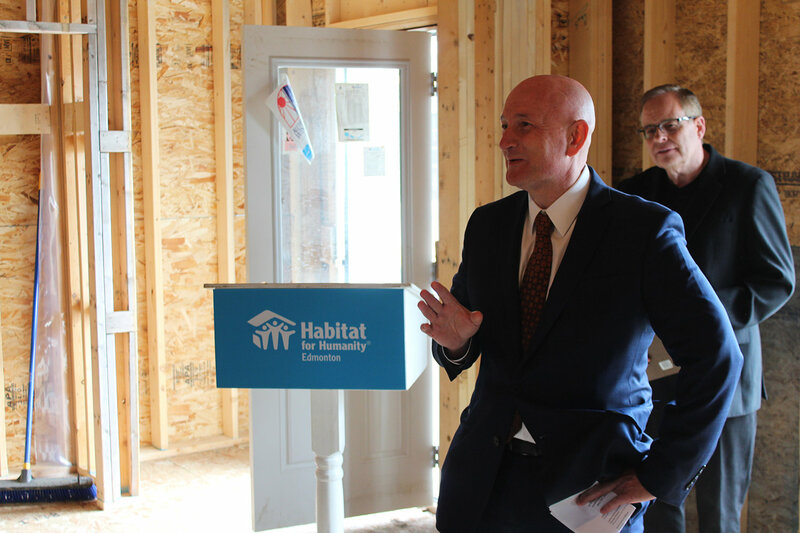 One community member even said, “We should have housing for vulnerable people in every community.” And today, the relationship with the local community is very positive, because of the efforts to build relationship and connection. Last year, the Community league swung by to pick up a few tenants for the Christmas party. Local churches have also been supportive, with a local Baptist church giving pumpkins every fall. Some tenants would go to service there. They also have local neighbours come and volunteer from time to time and drop off donations of books and CDs. 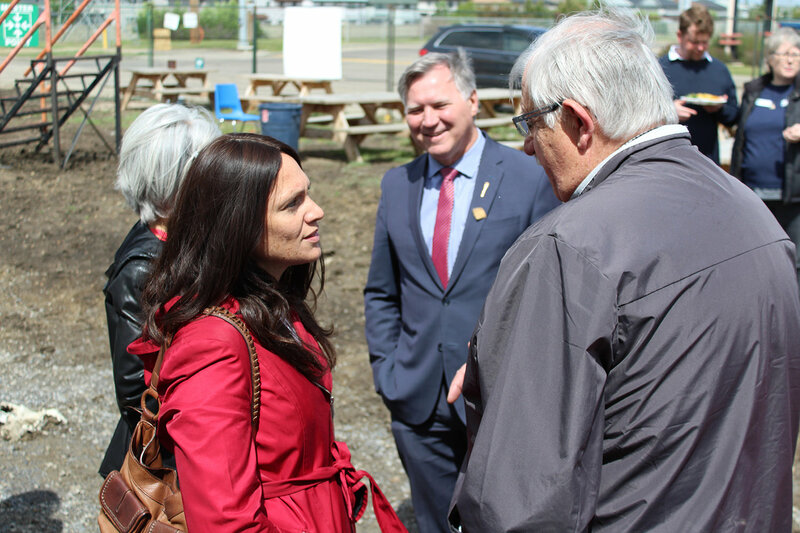 The Schizophrenia Society’s efforts at consultation with the local neighbours were rewarded, and today Iris Court has found a wonderful home in the Bonnie Doon Community. Unfortunately, some behaviors related to this illness can threaten a person’s ability to keep their apartment or stay housed. Yelling out loud to nobody… Acting strangely… Seeing things that aren’t there… Delusions and Hallucinations that you act on sometimes. Most landlords are not in a position to be understanding and/or provide supports. And without access to adequate supportive housing, many folks with Schizophrenia end up on the street, greatly worsening their situation. That’s where a place like Iris Court is critically important. Iris Court provides home to twenty-one tenants diagnosed with this persistent mental illness. Two staff are on site 24×7 to support tenants and help them retain their housing. They will help with programming, ensure the safety of residents, and if a person is having a really bad, they have someone to call. Iris Court is somewhat unique as it is a lodge style Permanent Supportive Housing. So tenants do not have a private apartment with their own kitchen and living area. They have a fully furnished bedroom and an ensuite, but everywhere else is shared space. The on-site kitchen provides three meals a day and snacks. Food, linen and cleaning supplies are also provided, so all a tenant needs to provide are personal clothing and personal care items. There are no clinical supports or treatment provided by on-site staff. If a tenant wants or needs medication supports, they are set up with these by Homecare. One of the challenges many of the tenants of Iris Court face is that their networks of community, supports and relationships are often more in the City’s core neighbourhoods. This is particularly true of people finding home there after living on the street. Some don’t want to live on the south side. It’s a big change. However, the Bonnie Doon neighbourhood has proven to be a good place for people to grow and access local community supports. There is a Pharmacy and a local doctor’s office close by to look after tenant needs. They also have easy walking access to the local swimming pool, the Library, a Bowling alley, Grocery store, Mall, and Church communities. Within Iris court, they do much to engage both tenants and their families. They host a family advisory council to talk about quality of life and what can be improved. The last Tuesday of every month they also host a multi-tenant meeting, which serves as a place to address concerns, and to generate new ideas. Out of that grew a social committee, which has helped organize events (with a little staff support), arranged for a Karaoke machine, and did some thinking about pets. Very soon, they will be getting a dog! Everyone’s story is a little different. When one tenant came to Iris Court, he was unable to leave the building out of anxiety and fear of people and rejection. Now he is showing some success. He is able to go shopping, and take the bus. He is feeling comfortable in the local community. Another, tenant wanted to look for a part time job, and found one! One tenant did so well he moved out. He got his own place. Went to school, and has a job! But Iris Court is not meant to be a transitional home. It is meant to be home for the long term. How about drugs and alcohol? Several tenants are in recovery, and sobriety is strongly encouraged. Iris Court is a harm reduction facility, so no one is going to be evicted for coming home drunk. But staff need to be very considerate of the need of the tenants. Trueman Macdonald, Director of Housing at Iris Court notes that many are teetering on the edge every day. If someone is loudly off balance with an addiction, it disrupts a lot of others. Evictions are not done lightly. In confronting behaviors of concern, staff usually work on a plan with the tenant to work on the issues. Macdonald notes that an assault or violent behavior will result in eviction faster. “Punching a hole in the wall? Probably not, but it depends on why you did it. Perhaps you imagined bugs in the wall, or had a voice in your head telling you to do it.” Staff also help tenants who struggle with hoarding or collecting stuff. In these cases, they do a room visit once a week, with the goal of helping a person learn how to manage their space, as these can be a reason they lose their housing. As far as other points of success, Trueman Macdonald reports that they have had very little turnover in staff, which is a really good sign. As well, as part of their licensing as a lodge level facility, Accommodation Standards must be maintained. Guidelines require keeping a daily account of tenants, assessing risk, building maintenance, menu and meal requirements, Macdonald reports that Iris Court has been fully compliant and has been for the last three years. Profile by Mike Van Boom, based on an interview with Trueman Macdonald, Director of Housing at Iris Court. Interfaith Habitat Works 2018; the Wrap-Up Party! 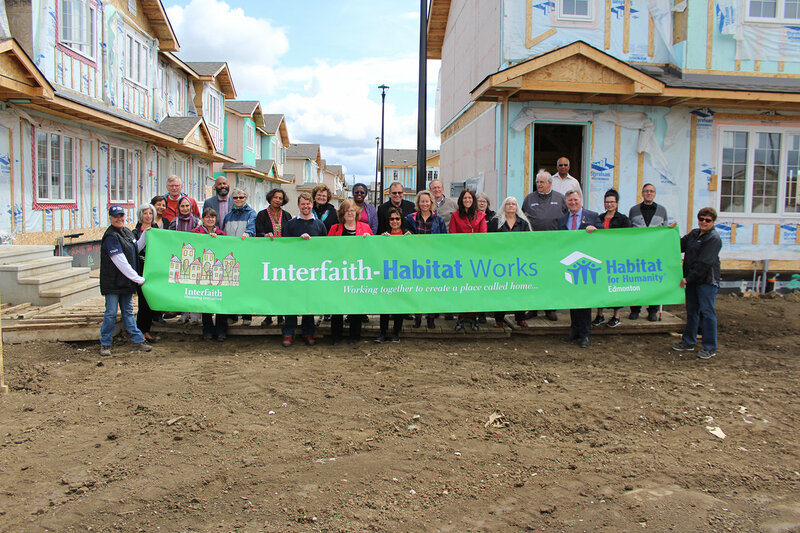 On May 31, 2018 CRIHI members gathered at Habitat for Humanity’s Carter Place build to celebrate the work Interfaith volunteers were able to accomplish this year. OVER 300 Volunteers; 48 lunches served! Here are a few of the names and faces above: We heard faith community representatives from Muslim, Jewish, Sai Baba Centre, Ismaili, Roman Catholic, Anglican, Christian Reformed, Quaker, and Anglican. 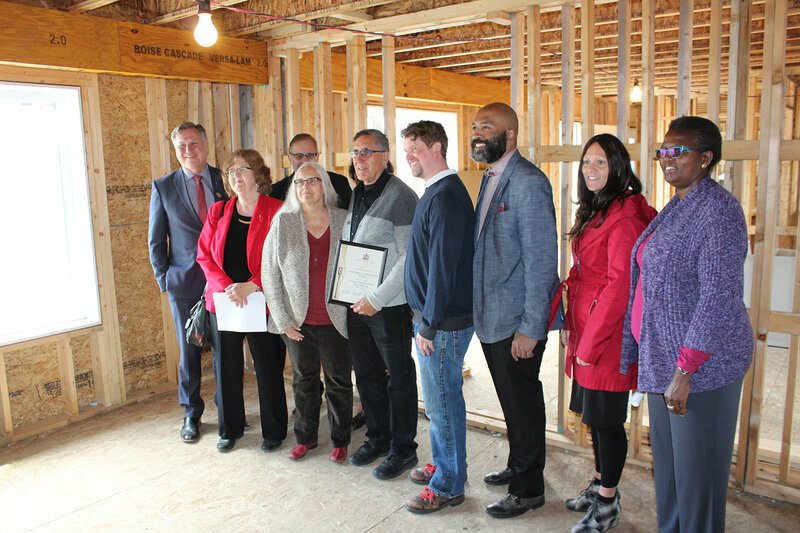 Of special mention is CRIHI’s own Fraser Williamson, who we honoured for his tireless efforts the last seven years as coordinator for this Interfaith Habitat Works project. 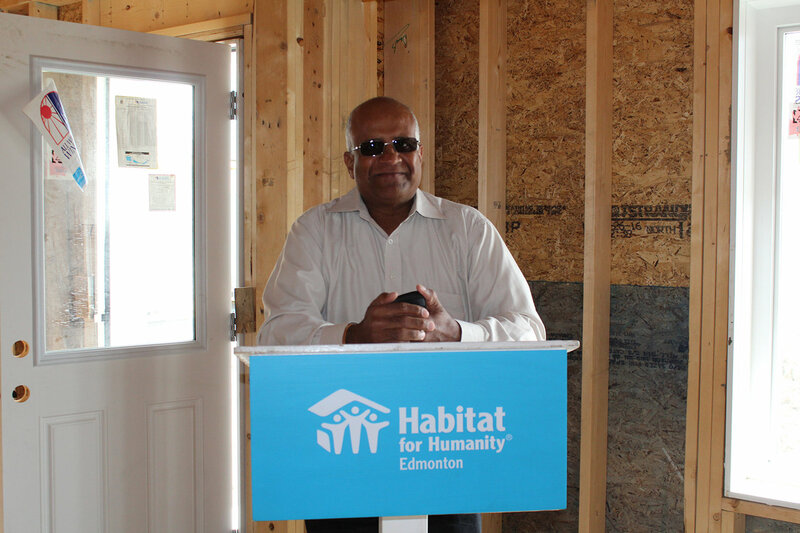 Fraser, we cannot thank you enough for all your work to make this project so successful!